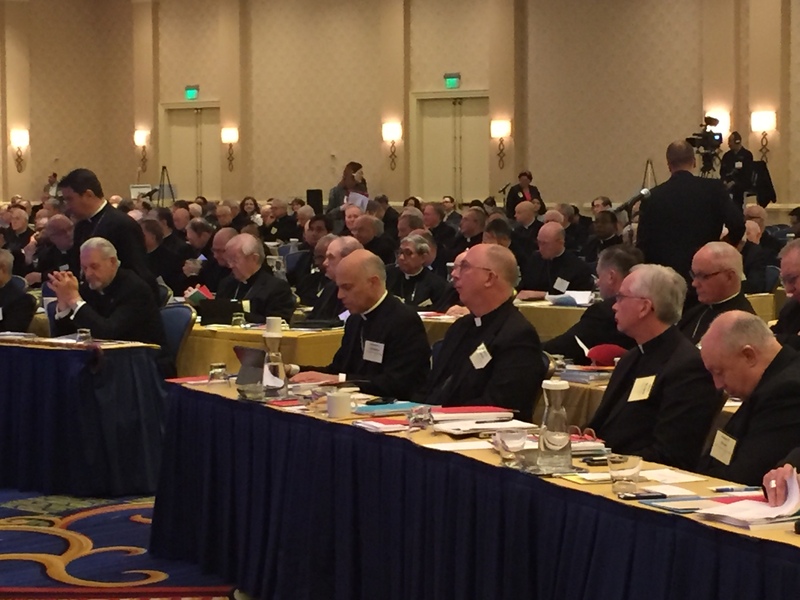 In a surprise expression of discontent—how widespread remains to be seen—two bishops here at the U.S. Conference of Catholic Bishops fall assembly in Baltimore threw a monkey wrench into what has been a more or less pro forma process in the past, asking their fellow bishops to consider tossing out altogether the quadrennial “Faithful Citizenship” document and starting over. Bishops Gerald Kicanas of Tucson and San Diego Bishop Robert McElroy both acknowledged the hard work of U.S.C.C.B. staff and the document’s working committee, but argued that the mandate given to the committee last year—to revise and extend the existing documents which dates back to 2007—may have been in error. Bishop McElroy questioned the lack of attention and emphasis in the document to the areas of concern that Pope Francis has made the keystones of his pontificate—addressing the needs of the global poor and responding to the degradation of the environment and the social and economic order which propels it. Bishop McElroy said, “The problem is this that original mandate in retrospect was a serious error, the decision said that it should proceed and keep to the compact and philosophy and content of 2007. Cardinal DiNardo said the working committee had “brought in Pope Francis, perhaps not to your satisfaction and to the rhetorical flourish you bring [to these issues].” The statement, he said, was nonetheless “still useful.” He cautioned the bishops that rejecting the working document would probably mean not have a guide at all for Catholic voters in time for the 2016 elections. The bishops typically release their “Faithful Citizenship” guide in the year before the election to avoid becoming susceptible to allegations of political partisanship. He added, “What do I sense is going to happen today? I don’t know. Cardinal Donald Wuerl of Washington said, “I think we have a good working document.” He said the statement merits approval “so that we will have something done this year and not run the risk of having to produce a new document in an election year. The archbishop agreed with Bishop McElroy that “the issues of global poverty and the degradation of the environment now need to be put into the first tier of issues” of concern to Catholics alongside abortion, assisted suicide, and others that have long been a focus of the conference. Is Pope Francis moving so quickly on new themes and interests that it has simply become difficult for local conferences such as the U.S.C.C.B. to keep up? Archbishop Cupich said, “[Pope Francis’s] pace is really being directed by the Holy Spirit; I think if that’s the case, the pace is just right. He added, “The Holy Father is speaking in a way that is touching the aspirations of a lot of people, and that includes the bishops. I think we are trying to discern what we’re called to in response to the many imaginative things the Holy Father is calling us to look at very carefully. Looks like we really are entering a new era. Since the current version on the USCCB website covers much about Global solidarity, I'm not sure what the objection is. However, if it is to be brought "up-to-date" there needs to be something in there about calling our political leaders to robustly oppose the carnage of ISIS, or as the Holy Father says the "piecemeal Third World War." The American public's blanket opposition (until recently) to a military engagement with ISIS has given cover to the President to permit the new Nazis to incubate and grow over the last few years. Bernie Sanders is so wrong on this - the ISIS threat is far more immediate, more threatening and more vicious than any CO2 emissions (which are in any case coming down because of fracking and other environmental improvements). ISIS is just a global policing problem. The bishops should stress the Christian attitude to immigrants and the Church's love and respect for Islam. They should also address these problems: 1. the endemic racism of US society. 2. the gun problem. 3. mass incarceration. But they won't, because all these points would favor Clinton or Sanders.